Poor Katherine, thinks all is bright and fluffy in her life until…it’s not. It all falls apart and she’s shocked. She finds out that the perfect life she’s been living is a lie. She’s been working hard, has a great job and a lovely home. She’d like children but Ron wants to wait – he likes their life and says they’ve plenty of time yet. 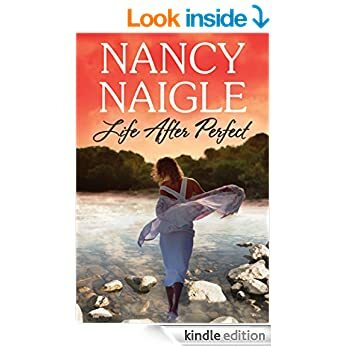 Then it all crashes down, just when things have gone wrong too for her friends, one had been widowed, and another finds out her husband has been cheating. Katherine just can’t deal with it all, and gets in the car and just drives. She ends up in a little town, where its Blackberry Festival day and it seems the whole town is out. She’s decided to look at what she wants from life for her, realising that Ron has dictated everything so far, the car she drives, the posh house and decor, even her name. She was happy as Katy, but he said Katherine sounded better – now she’s claiming herself back and is Katy again. Then at the festival she bumps into Derek, and there’s something between them that’s hard to ignore. Through events back with Ron and developments from it she stays in the village, and they take her to their heart. Derek is pleased, he’s not felt this way for a very long time. After his wife died from cancer he’s just been kind of drifting, working all hours just to hold back from thinking of the past. Then Katy springs in his life and somehow he knows she’s important. He’s a really lovely man and perfect for Katy. He wants her, but wants what’s right for her too and Ron was never interested in that – Ron came first, last and everywhere in between. It’s only now that Katy can see that. There are some great characters here, and among the sadness of one of them dying from cancer, is some really heart-breaking moments, issues raised that are relevant to many people and yet a thread of humour runs through, stopping it from being too dark and gloomy. I loved the connection between Derek and Katy, though I’d have felt it more genuine if the story had covered a longer timespan. It’s hard to feel that Katy has found a genuine love, when its so shortly after she thought her life was perfect. In a way its a bit like thinking she was in love with Ron til she met Derek and then recognised the real face of love, but I found it hard to accept that she could leave her feelings behind so quickly. When things went wrong for a while it was very brief and for me I like that part to be longer, to let the drama play out and for me to really feel upset for the couple. Here though it was almost over before it began, and that lost the impact of it for me. God crept in a bit too – something I’m always cautious of, but it wasn’t in a preaching way and fitted the characters perfectly, given that they were strong believers in God’s Plan. I’m not anti god, anti religion, but don’t want to have it thrust down my throat when I’m reading. At the first mention I was a bit “ is this going to become one of those…” but it didn’t and when God was brought in it fitted the story as exactly how those characters would react. That added to the feeling they were genuine, and I really enjoyed living a couple of weeks with them (albeit over a few hours!!) A couple of things stuck with me from the humour, Katy selling her Merc and Ron’s reaction to that, and the lipstick incidents in the office and on the car – perfect. Stars: Four, a really fun feel good romance.